In this age of acceleration, sometimes you need something that will sit on a windowsill, chill and laid-back, demanding only access to the sun and a little bit of water every couple of weeks. 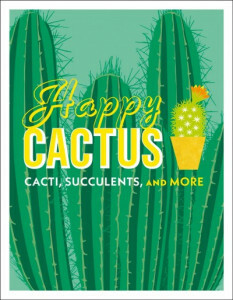 Access to the sun aside, the opposite of a cat and that’s where the new book Happy Cactus: Cacti, Succulents and More comes in, providing a great introduction to low-maintenance houseplants. Covering 105 different types of plant, from the seemingly ubiquitous Christmas cactus to striking ones like tiger aloe and the beautiful and subtropical Black Rose cultivar, Happy Cactus has a variety for everyone. Fully illustrated with sidebars for each on when to water, how much sun is required, what to feed and when and how to generate a new plant, the book also highlights ones that are able to grow to large sizes and ones that are good to put in hanging pots. Put a hold on Happy Cactus today!